Saturday February 21st 1891 I was busy about the work most of the forenoon and the Woolf girls come over to spend the afternoon. They stayed till after supper and Will and Mary come to spend the evening. The boys went to town to see the [Mesmerist?] and it was nearly midnight when we got to bed. Sunday February 22nd 1891 I went to the Methodist Church and enjoyed Mr. Pratts sermon very much. I soon got some dinner when I come home and we talked all afternoon. John & Hatt were over to supper and spent the evening. Monday February 23rd 1891 We got breakfast over and took Lizzie to the depot for the nine oclock train. After we come back Will went in the country to see about a horse and I done up the work and practiced awhile. Will took me over to see Fanny in the afternoon. I wrote and practiced in the evening. weather very mild today. 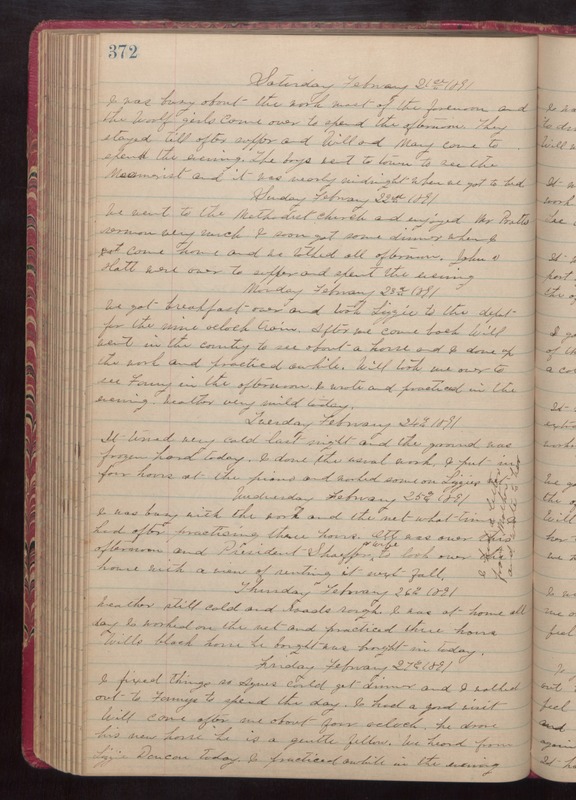 Tuesday February 24rh 1891 It turned very cold last night and the ground was frozen hard today. I done the usual work. I put in four hours at the piano and worked some on Lizzies net. Wednesday February 25th 1891 I was busy with the work and the net what time I had after practicing three hours. Ott was over this afternoon and President Shaeffer & wife to look over the house with a view of renting it next fall. [the following text is written vetrtically in the right margin of the above entry] I had a letter from Mother and wrote to her. Thursday February 26th 1891 weather still cold and roads rough. I was at home all day. I worked on the net and practiced three hours. Wills black horse he bought was brought in today. Friday February 27th 1891 I fixed things so Agnes could get dinner and I walked out to Fannys to spend the day. I had a good visit. Will come after me about four oclock. He drove his new horse he is a gentle fellow. We heard from Lizzie Duncan today. I practiced awhile in the evening.